1. There are a few substances that are not allowed to be used in cosmetics. 2. All color additives must be approved for their intended use. For example, a particular color additive may only be used in an eye shadow if it is approved for cosmetic use, including the area of the eyes. Many colors even have to be "certified" by FDA. That means that samples from each batch must pass special testing for purity in FDAs own labs before they may be used. "Warning: The safety of this product has not been determined." · Never apply mascara in a car, bus, plane or any other moving vehicle. Its easy to scratch your eye if you hit a bump or come to a sudden stop. · If mascara gets dried up, dont add water or - even worse - (yuck) spit into it to moisten it. This can add germs that may grow and cause an infection. · As mascara gets old, it is more likely to have germs growing in it. Throw it out after three months. · Dont share mascara - not even with your best friend. You might be sharing germs that way. · Remove all mascara, and any other make-up, before you go to bed. Bits of mascara can flake into your eyes and cause an infection. Its Fine to use Hair Dyes on your eyebrows & eyelashes. After All, theyre hair, too. Never use hair dyes on the eyebrows and eyelashes. Doing this can cause blindness. There are approved, safe colors for mascara and eyebrow pencils, but no hair dyes are approved for tinting or dyeing the eyebrows or eyelashes. Lasers have made it easier to lighten tattoos, but its not as easy or as reliable as many people think. 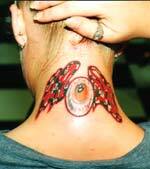 Lightening a tattoo generally takes several treatments and can be expensive. How well it works depends on the tattoo. Many tattoos can be lightened until they are much less noticeable, but usually a trace of the tattoo remains. Also, some tattoo colors are harder to remove than others. Laser treatments can turn some tattoos darker instead of lighter, or change them to a different color. The same goes for "permanent makeup," which is a kind of tattoo. It depends on what ingredients went into the tattoo ink to produce the color. But it can be hard to find out whats in tattoo inks because they usually dont have ingredients listed on the label. Very often, even the tattooist doesnt know whats in the tattoo ink because the company that made it considers the formula "proprietary" (pro-pry-uh-tar-ee). That means its a trade secret. · FDA has not approved any color additives for injection into your skin. · People who get a tattoo should not give blood for a year afterward because of the chance of infection. · Although it happens only very rarely, some people may have an allergic reaction to the dyes used for tattooing. Imagine being allergic to something thats been injected into your skin. · Or, the tattooist may make a mistake. Who wants to wear someone elses mistake forever? Speaking of forever, how often do you change your mind about your hair, your earrings, or the clothes you like to wear? Its not so easy when you change your mind about a tattoo. EXTRA BONUS INFO! Although many "temporary tattoos" are legal, some -- especially some of those imported from other countries -- are illegal in the United States because they use color additives that are not approved for use on the skin. FDA has had reports of people having allergic reactions to temporary tattoos. Could these ingredients hurt you? It depends. Individuals are different and may be sensitive to different things. If you dont know what the ingredients are, its impossible to tell what they might do if you put them on your skin. "Cruelty Free" or "not tested in Animals" Means that no Animls testing was done on the Product & its Ingredients. Even if a product never was tested in animals, theres a very good chance its ingredients were. A company might call its products "cruelty free" because it isnt doing any animal testing on these ingredients now, although the ingredients may have been tested on animals in the past. In some cases, "no new animal testing" might be a more accurate claim. If a Products is labeled "All Natural" or "Organic", Its Probably Hypoallergenic. Remember, poison ivy is all natural, too! But you probably dont want it on your skin. It is very possible to have an allergic reaction, or other irritation, from products labeled "all natural" or "organic." For example, lanolin, from sheeps wool, is a common natural ingredient in some moisturizers that sometimes causes allergic reactions. Even if a Product is Labeled "Hypoallergenic", It may contain substances that can cause Allergic Reactions. After all, people are individuals. And theres no telling what any individual may be allergic to. According to the cosmetic industry, "hypoallergenic" means "less likely to cause an allergic reaction." But dermatologists - and consumers who have allergies - know that the word "hypoallergenic" on the label is no guarantee against an allergic reaction. · Did the dermatologist work for the manufacturer? · How many people was the product tested on? · How long did the testing last? · What were the results of the testing? Weve come a long way since European ladies used to powder their faces with a lead-based, highly toxic white face powder. But how safe are the cosmetics you use today? Who has oversight of this $45 billion dollar industry? What should you watch out for, and how can you protect yourself? We brush, wash and groom ourselves everyday with an astounding collection of lotions and potions. We assume theyll make us cleaner and more attractive, not sick. And we rarely worry about the safety of the ingredients unless we suffer an adverse reaction or hear a negative report in the news. When it comes to cosmetics, its not easy to be an informed consumer. You can read the labels, but youd need a Ph.D. in chemistry to decipher the ingredients. But the U.S. Food and Drug Administration (FDA) does provide information that can help consumers decide which soap or skin cream is best for them. Cosmetics that make therapeutic claims, such as these products are required to list their "active ingredient" first on the label, which is how consumers can differentiate between cosmetics and cosmetics that make health claims. Manufacturers of these types of cosmetics must be able to scientifically prove that the products are safe and effective before they are sold. Regulating cosmetics are not required to undergo FDA testing or approval before they are sold on the market; FDA regulates them only after they are made available. But there are certain substances that manufacturers are prohibited from using. The length of time a product can be used under normal storage and use conditions; a product may expire earlier if it has not been stored or used according to instruction. Deciphering ingredients The list of ingredients on a cosmetic label is listed in descending order of quantity. Youll find that water is the first ingredient in most skin care products. · Detergent bubble baths can irritate the skin and urinary tract through excessive use, particularly if you take long baths. Discontinue use if you experience a rash, itching or redness. · Feminine deodorant spray for the genital area should only be used externally and not applied to broken, irritated or itchy skin; stop using if rash or irritation occurs. · Hair dyes with coal tar can cause skin irritation and blindness if used to dye eyelashes or eyebrows. In addition the ammonia, soaps, detergents, conditioners and dyes found in hair color are also major eye irritants. · Depilatories and hair straighteners are highly alkaline and can cause serious skin irritation. · Nail builders (elongators, extenders, hardeners and enamels) can contain methacrylate monomers or formaldehyde that can cause irritation or allergic reactions. Nail enamels with hardeners have a high resin content that blocks air from the nail surface and makes the nail brittle. These products are also flammable. · Artificial nail removers contain a powerful toxin, acetonitrile, which has caused injury and death; these products require child-resistant packaging and should be used according to package instructions. · Aerosol hair sprays may contain alcohol and isobutane and are flammable; when using them, never smoke and avoid heat and fire until the product is completely dry. FDA has received reports of adverse reactions to two new cosmetic ingredients-alpha hydroxy acids (AHAs) and beta hydroxy acids (BHAs)-which are widely used in skin creams and body lotions. They are touted as being able to reduce wrinkles and age spots and repair sun-damaged skin. They can cause skin irritation, such as swelling, burning, blistering and itching. Studies of these two acids are ongoing, with results expected later this year. In the meantime, FDA recommends testing these products on a small area of skin first, avoiding the sun, and applying a sunscreen when using them. In addition, scientists have found a possible link between DEA-related ingredients found in many cosmetics and cancer in laboratory animals. DEA-related substances are found in many products, including soaps, body washes, and bubble baths. FDA is currently studying the evidence to assess the public health risks. However, there is no truth to a claim made in a letter distributed over the Internet reporting that sodium laureth sulphate, a common ingredient used in shampoos and toothpastes, is carcinogenic. In spite of the possible risks, the good news is that most of us use cosmetics everyday with no adverse affects. With a little caution and careful shopping, that should always be the case. · Dont inhale hairsprays or powders. They can cause lung damage if inhaled regularly. · Never use aerosol products while smoking. They can ignite. Phone: 1-800-270-8869 Call this number to report adverse reactions to cosmetic products. Serious problems from cosmetic use are rare, but sometimes problems arise with specific products. For example, FDA warned consumers about the danger of using aerosol hairspray near heat, fire, or while smoking. Until hairspray is fully dry, it can ignite and cause serious burns. Injuries and deaths have occurred from fires related to aerosol hairsprays. Another problem can occur with aerosol sprays or powders; If they are inhaled, they can cause lung damage. The most common injury from cosmetics is from scratching the eye with a mascara wand. Eye infections can result if the eye scratches go untreated. Such infections can lead to ulcers on the cornea, loss of lashes, or even blindness. To play it safe, never try to apply mascara while riding in a car, bus, train or plane. Sharing makeup can also lead to serious problems. Cosmetics become contaminated with bacteria the brush or applicator sponge picks up from the skin--and if you moisten brushes with saliva, the problem is much more severe. Washing your hands before using makeup will help prevent exposing the makeup to bacteria. Artificial nails can be a source of problems, especially when not applied correctly. Artificial nails must be completely sealed because any space between the natural nail and the artificial nail gives fungal infection an opportunity to begin. Such infections can lead to permanent nail loss. Sleeping while wearing eye makeup can cause problems, too. If mascara flakes into your eyes while you sleep, you might awaken with itching, bloodshot eyes, and possibly infections or eye scratches. To avoid eye infections or injury, remove all makeup before going to bed.